Want to connect with your blog audience on a deeper, more intimate level? And want to create an extra income stream while you’re at it? Perfect, because offering one-on-one services as a way to monetize your blogging platform is a brilliant place to begin your online entrepreneurial journey. Getting into your ideal clients’ pain points and struggles like an acupuncture needle in an aching back will give you tons of insight into your clients’ existing situation and how you can help. You will also be building strong connections with your general audience as your one-on-one conversations lend themselves to richer blog content, e-course material inspiration and future group coaching possibilities. And all this while also providing a whole new level of dreaminess to your clients’ experience because they’re craving that intimate one-on-one time with you, too! Where Do I Start When Building a One-On-One Service Offering? It takes a special brand of courage to put yourself out there in this capacity. Luckily, it’s so very worth it and it’s really not that scary once you try it. Not only is this move a smart blogging strategy on a lucrative level, being the fastest path to cash and all, but it’s a brilliant investment to your business on a fulfillment level as well. And while taking that first step of putting your expertise out there by opening yourself up to one-on-one time with a total stranger (on paper at least) might bring up some uncomfortable sensations, it gets less scary the more you do it. The trick shake off that fear? Ask yourself: What’s the worse that can happen? Exactly! Not much other than that ear-piercing sound of crickets if no one signs up. And even if your worst-case scenario happens, there’s loads of support available to you to bounce your ideas off of. So, really, you have nothing to lose. 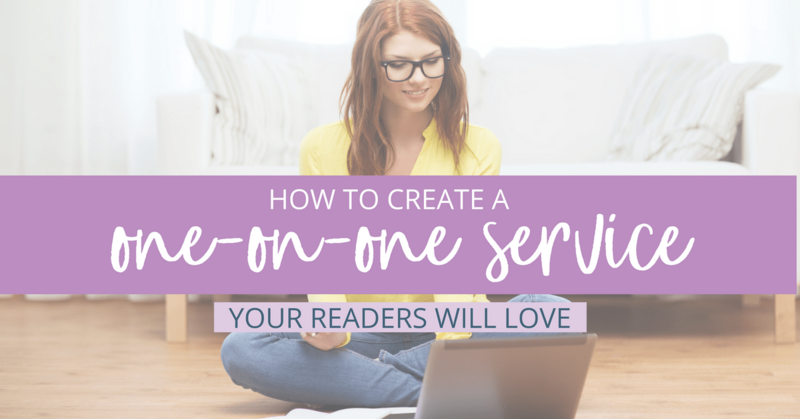 Now let’s create a one-on-one offering your readers will love! What Exactly is A One-On-One Service Offering? You. One other person. On the phone, email, Skype, Zoom, or in person. For one hour, once a week. Or one time only. Once a day even! It depends on what you want, what they want and what works best for the problem at hand. And, not to be a downer but… there are so many problems to choose from! Really, any industry, blog niche or life path could benefit from some personalized attention, custom strategy and gentle accountability. But the important piece here is you get ridiculously specific on what problem you’re there to solve. Because clients buying one-on-one offerings love knowing what exactly they’re signing up for. A confused buyer doesn’t even become a buyer. At least not from you. And fret not if you feel your offering is already being offered by someone with shinier hair, whiter teeth, and a prettier Instagram feed than yours. That special sauce they’re missing on their picture-perfect avocado toast is you. The person that they’ve been attracted to, in a blog love kind of way, for a while now, and someone who has that special way of embracing a current theme that they want to improve on. So throw them a one-on-one bone! If you’ve been blogging just for fun up to this point, you’ve probably noticed that there have been at least five different topics you find yourself writing about over and over again because you simply can’t help yourself. But now that you’re about to get a bit more strategic, let’s get some clarity on what topic you’re going to really hunker down on, at least for the next few steps I’m going to share with you, so can be of most service to your valued readers. If you’re already blogging for an existing business, consider which of the topics you find garner the best feedback, most questions, and you feel the most comfortable tooting your expert horn in. From my own hobby blogging days of yore, with a million categories ranging from cheese making to spinning art yarn, I would choose sewing. Step 2: What Problem Related to This Topic Can You Help Them Solve? What is THE biggest struggle your readers or existing clients are battling with which you feel most qualified to help? Are you confident, where you stand right now, that you can deliver them some results on this topic? It pains me to even choose what flavor of kombucha to go for these days, but in this precise moment, you need to bite the bullet and just choose one! You can come back to this exercise again and again for future one-on-one offerings. If you’re super stumped here, you can take a peek at the emails you get from your followers when they gush to you about how your words/podcast/videos have helped them or when they ask you questions. Or put a call out to your readers and start asking them where they might be struggling in a particular area that you may be able to assist them in. What are you struggling with in relation to [your topic of choice]? Have you ever sought help for this before? If so, what did that look like? If you could wave a magic wand, what would it look like if you could get some help with this subject? If it helps, let them know that if they respond you’ll add their name into a drawing to win a gift certificate or maybe even a free coaching session once it’s revealed. Freebies and a chance for a sweet prize are great feedback lube! Meld the common themes from the responses with a little soul searching of your own on what you are ready to offer and how you want to go deeper with your readers. Example time! From my sewing theme from hobby blogging days, readers confided in me that they wanted to sew more, but with small kids at their feet, it felt like mission impossible. I could offer a one-on-one experience to work with me to get a simple project picked out, learn strategies to release perfection and delegate the steps of the project to time perfectly with their kids’ nap times and awake times that would work for them. Accountability and celebrations of baby steps they had taken were held with twice-weekly check-ins. 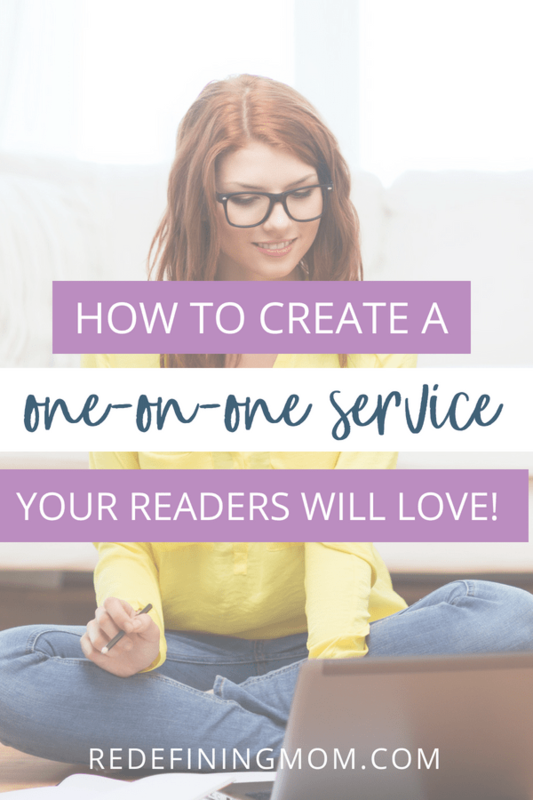 The more clearly spelled out your one-on-one offering is, the more it’ll draw in your dream reader. You can tweak the name of your offering to make it snappier but this starting off point will help remind you of the importance of having a tangible outcome. Step 5: Now Get the Word Out! This might be the scariest piece of the puzzle. You want to make the declaration that you now have a way for your peeps to get a piece of you while also delivering ease in their struggle. Who is this offering perfect for? What specific problem will this offering help you with? What result will they see (make it super tangible!)? What’s the next step to sign up? Now, you can start sending people to these words. Send that email. Do that Facebook Live. Send out those personal invites. Be sure to sprinkle these invitations with the love and good intentions of wanting your beloved readers to succeed in this sticky area of their lives. Need a little more details and hand holding on these steps and more? I have a FREE five-day e-course that offers videos, worksheets, and opportunity for feedback on which one of your offering ideas your readers would love. You can sign up for that here. But for the most part, the fear, and any feelings of being stuck will slowly ebb away once you begin taking the first few steps. Again, this is just the first of what may be a long list of one-on-one experiences you will be creating for your readers, followers and existing clients. Might as well get comfy with it now and reap the bliss of creating intimacy with this online community so beautifully eager to support one other. Kathy Stowell is a trainer and mentor for moms who want to start coaching other moms. 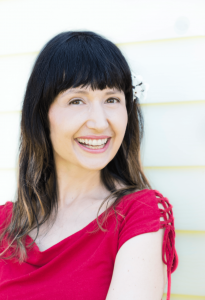 She’s the founder of Mama Bliss Coaching School, 12-week life and creativity coaching training program that has certified over 30 moms in eight countries so far and has been blogging at Bliss Beyond Naptime since 2006. She lives in the sleepy mountain town of Nelson, British Columbia with her two kids and rock-climbing-obsessed husband and stays awake by drinking three triple shot lattes a day and walking her mini-dachshund, Angel, twice a day. Thank you so much for sharing your expertise with my audience! This is perfect! I’ve been considering creating a new offer and Kathy just convinced me to take action. Steps are so easy! Thank you so much. What a great article! Thank you for sharing your brilliance, Kathy!!! This article is so timely for me because I am eager to start offering 1-1 services again. I love the tips on how to decide on an offering and how to name it. Thank you for writing such a helpful, step -by -step guide. I look forward to your free e-course, too.